Our Amish Traditional Flat Panel Island offers a classic look that will bring beauty to your kitchen. Handcrafted by Amish craftsmen right here in America, this piece is made with the superb craftsmanship that the Amish are known for. One adjustable shelf comes standard inside this versatile piece. Above, you can view the option of adding 2 sliding shelves for extra convenience. A 3-tier pullout shelf is also a possibility, which makes for excellent storage at your fingertips. Be sure to scroll down in order to view all of your options! 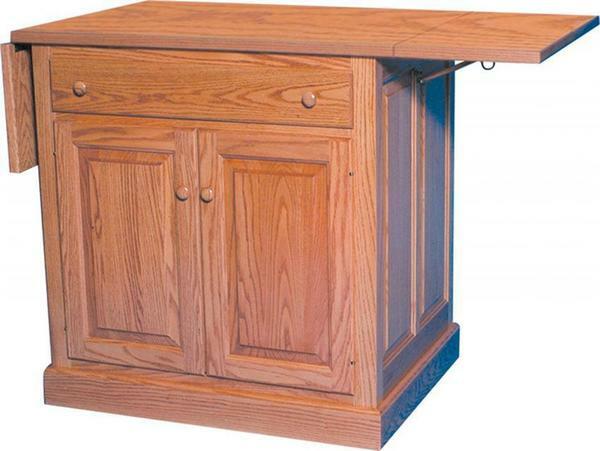 This piece is pictured above with an oak butcher block top which we love for easy meal preparation. Not only is this piece a great substitute for pulling out a cutting board, it also offers a solid place to enjoy casual dining after a quick cleanup. Check out our wide array of bar stools for the perfect piece to pull up to this beauty. Feel free to give us a call in order to discuss any questions that you may have: 866-272-6773. We are here to help!